The evaluation board utilizes a 4-layer design. From the gold-plated ground plane, you can clearly see via-stitching around the ground connectors of the SMA connectors and the via-fencing along the main signal path. These techniques are common in high frequency circuit designs to maintain low impedance and prevent crosstalk and interference. 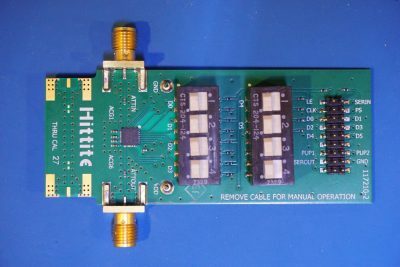 HMC624LP4E is an MMIC (monolithic microwave integrated circuit) fabricated with Gallium Arsenide (GaAs) semiconductor. 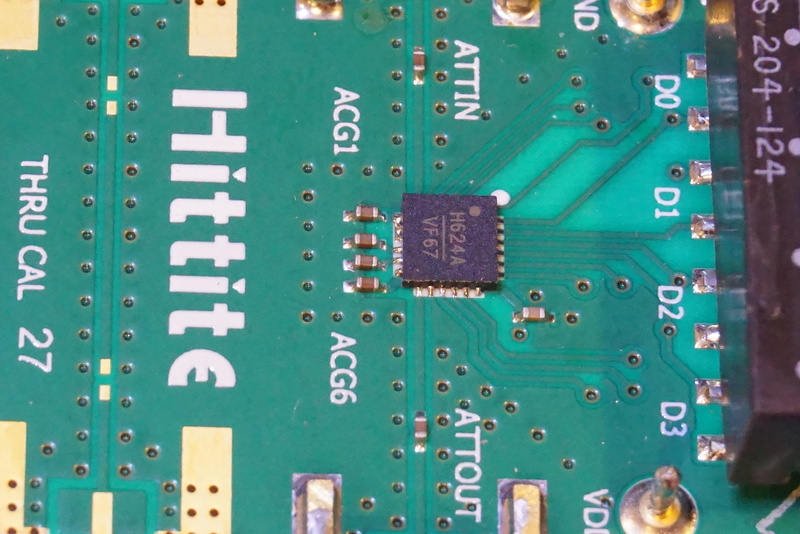 The picture below shows the chip itself in its LFCSP packaging (4mm x 4mm) mounted on the PCB. 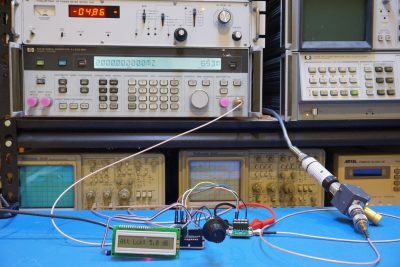 To enable SPI control (as opposed to the default parallel control), the PS pin (parallel/serial, or serial enable) needs to be asserted high. 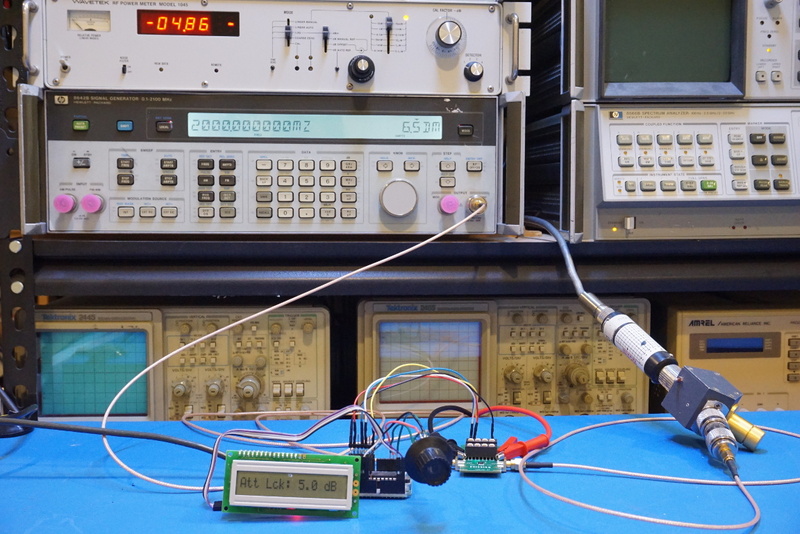 Here is a picture showing the digital attenuator connected to a 2 GHz RF source (HP 8642B) and the output from the attenuator is measured by my Wavetek 1045 power meter . 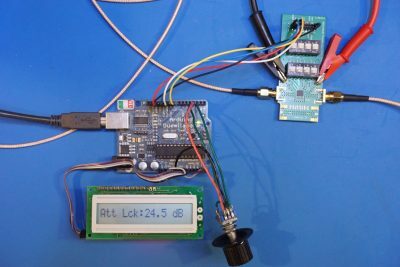 The output power from the 8642B is adjusted to 6.5 dBm to compensate for the loss in the cable so that the output from the attenuator is roughly at 0 dBm when there is zero attenuation. From the picture you can see that the attenuation is set at 5 dB and the measured power is at roughly -5 dBm. 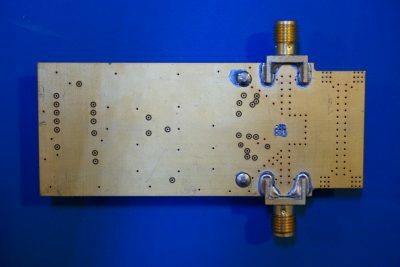 this is a really nice looking project, is this possible to know from where do you get your PCB made, is there some no standard techincal specificaltioin? 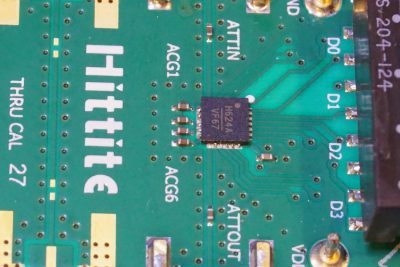 I got these boards directly from Hittite a while back, since its owned by Analog Devices now I think you can probably get from them.